This little girl just keeps growing - in so many ways! - We are seriously on the verge of crawling. As of yesterday, she started trying to crawl across the bed at our hotel. Not long now. At least we can keep all of this in mind as we look for rentals this weekend! - As previously mentioned, she is finally getting a tooth! I noticed last Friday that she seemed to be "chewing" a lot, so I stuck my finger in her mouth to discover her bottom left tooth is coming in. It hasn't affected her mood at all - still smiling and playing all day and sleeping at night. We're feeling pretty blessed! - Her smiles and giggles light up our days! She thinks her Dada is the funniest man alive and I love the way she lights up around him! B actually came out to BC a few days ahead of us, and when she saw him at the airport she started smiling and bouncing. Clearly her Daddy lights up her life, just as much as he lights up mine! - It won't be long before she starts standing as well. When we play in her nursery, she usually leans over and puts her hands on my knee or on Babar and pulls herself to her knees. She's bound and determined to be standing... but it also means she's really getting into things these days. - We're in a bit of a "stranger danger" time. She's pretty clingy to the two of us... especially me these days. She did okay when my parents watched her the other weekend, but she still just wants her Mama and Dada most of the time. - She's not very big! 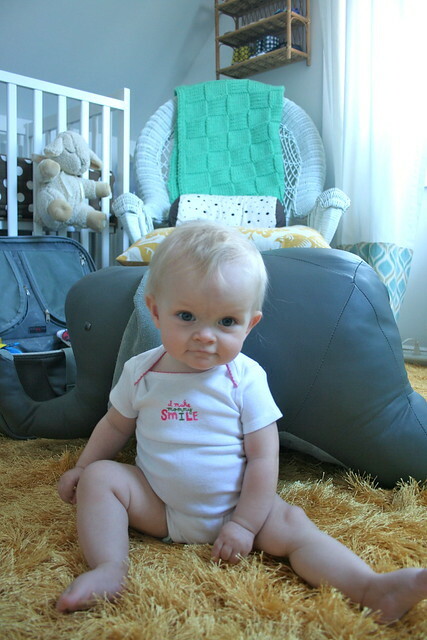 If you'r observant, you'll notice she is wearing the same onesie she was wearing in her 5 month photo. Baby girl is still in 3-6 months... and even has a few 0-3 month pieces that remain in rotation. She may just be around 16lbs... but then again - neither of us are very big, so it's not really a huge surprise. ah--she is such an itty gorgeous little gal! She really is so sweet. My Audrey was just a tiny thing too. Good things come in small packages! My 4 month old is in size 12 months. And he's pushing 20lbs! Wild, right? Chubby thunder thighs!!! Seems like yesterday you were posting tiny baby pics! She is starting to look like a little girl :) And those 7 mo pics are just the sweetest. Hallee is gorgeous, you lucky parents, you! What a doll! Sounds like you are enjoying every minute, it goes fast doesn't it? I remember those sweet days like they were yesterday and now I have blinked and my kids are teenagers! Good luck with your big move and have fun pulling the new home together.